Why settled for an iPhone dock with a display, alarm clocks, and various other features that require additional power, when you can have a giant horn set atop the mantel? 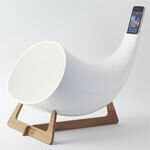 Italian design firm, en&is, is giving the world that option with its latest iPhone accessory release, MegaPhone. This large ceramic horn acts as a passive amplifier. Simply place your iPhone into the top of the device and the MegaPhone transmits your favorite tunes without the need for electricity. The MegaPhone is available in several colors and rests upon a hand-crafted wood stand. The MegaPhone retails for €399 to €599, depending on color selection, which is about $534 to $802 in U.S. dollars, therefore, we believe the MegaPhone is reserved for those with expensive, and quirky, tastes. In case you never have the opportunity to see one in person, en&is has included a promotional video showcasing the MegaPhone from all angles. Another example of collective, uncouncious aestheticization of iPhone as a work of art, a phallus and fetish object for distorting reality. Yeah, because anything nice is a fetish. Do you even know what fetish is? you know they are beggin their mommies right now. seriously?!? a horn?? lol. wait.. did apple just invent non-electronic sound amplification!? their laywers are going to travel back in time and sue edison before he "steals" the phonograph idea from apple. It makes a GREATTT gift! what the crap is this? i'd rather use this as a hat. please tell me this is some kind of joke . . . like honestly people this is not something that you decorate your livingroom with . . . G.A.L. I can make one just like it for less than $20... and then turn around and sell it for just half the cost of their model. It will work just as well (if not better), probably look just as nice (meh...), and only set you back $400... I, on the other hand, will be $380 richer and still not bother to waste my money on an iPhone.